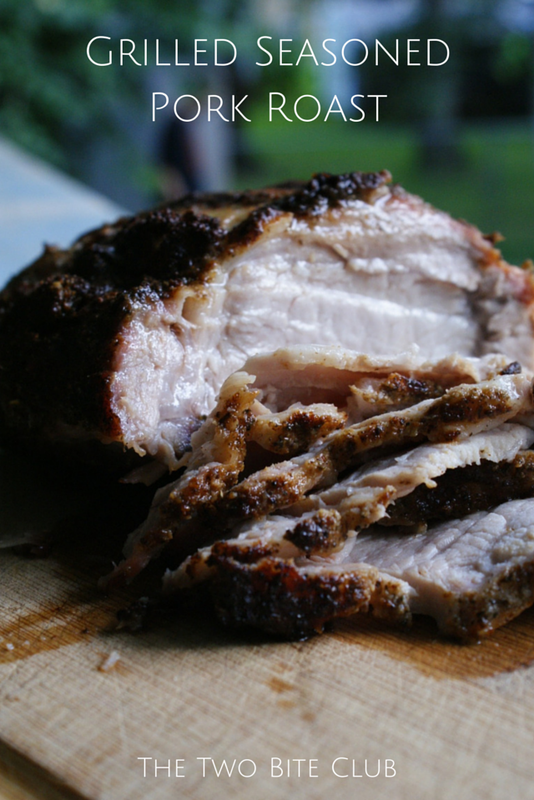 This Grilled Seasoned Pork Roast is rubbed with a simple combination of herbs and spices and is slow-cooked on the grill to juicy perfection. There was once a time when grilling was not particularly one of my favorite methods of cooking. I'll be honest. I was a high heat griller. I can't really explain why. Maybe it was a mental block. Maybe it was simple ignorance. I always just kind of thought that the grill should be good and hot to get the job done right. It's okay, you can mock me. I deserve it. I mean, what was I thinking? Needless to say, no matter what we did, burgers were usually charred little hockey pucks, chicken came out dry and black, and steaks were chewy and well done. High heat'll do that. Over time, I got a little tired of dreaming of juicy tender meat cooked at home. I don't know why it took us so long to simply scale back the heat a little, but when we finally did it was like a whole new world of home grilling opened up for us. I can honestly say that grilling is now something we look forward to! Some of my favorites are Grilled Marinated London Broil, grilled chicken breasts using this marinade, and this pork roast recipe. And would you believe I can't remember the last time I cooked a baked potato in the oven? True story. Grilled Baked Potatoes for life. If you're looking for a simple, juicy, flavorful pork roast that the whole family will love, well, look no further my friend. You'll love this one! Heat one side of your grill to medium heat, leaving the other side turned off. In a small bowl, combine the garlic powder, onion powder, salt, poultry seasoning and chili powder. Rub the mixture onto all sides of the roast. Place the roast, fat side up, onto the side of the grill that is not lit. Close the lid and grill for 1 hour 30 minutes to 2 hours and 15 minutes or until the internal temperature reaches 160 degrees. Let the roast rest for 10 minutes before slicing. This roast is so delicious and versatile. You can dress it down and serve it on toasted rolls with barbecue sauce (like we did!) or you can dress it up and serve alongside veggies and a side salad for Sunday dinner! Due to the fact that this roast needs to be cooked over indirect heat, it is best cooked on a gas grill. OMG! That's to die for!!! Hello! How many pounds of meat are you using for the cooking time? I use a 3 lb roast.